Home / Columnists/ Hang the House! It’s OUR country, future, etc. Hang the House! It’s OUR country, future, etc. I have rarely if ever empathised with the Sri Lanka Police Department. But when I saw those hapless cops ducking chilli bombs in Parliament, my heart went out to those whom I had previously seen as simply being PC Plods or Mr Goons. Sorry to say that the aggressors in the case of such egregious behaviour in our ‘august’ (yeah, right!) assembly were none other than ‘honourable’ Members of Parliament whom we elected and whose salaries we pay. However much we might think of them as our servants, they are evidently lords of misrule bound to no mere code of conduct – and probably would not be able to see the supreme irony in having the lawmakers of our land attack our law enforcers like it was a schoolboy scrum turned ugly and not an ‘august’ assembly (yeah, right!). Therefore today, we too pull no punches – and the sense of outrage that a nation betrayed by its own elected representatives must not lose the momentum by dint of simply letting off steam in a newspaper column or on some lame game social media outlet. I will address my comments directly to the leaders of our nation whom I see as being directly responsible for both the outrage as well as a failure to prevent their goons from egregious behaviour befitting more the animal kingdom than parliamentary tradition. Not even the shocked schoolchildren who watched their parliamentary uncles descend to the level of apes in oestrus would have been capable of such knavery on a bad day in the field with no referee or umpire to cry halt. There were prime ministers (both of them) past and present; a former president; a possible future brace of them… young and immature as much as geriatric and passé; party leaders, elder statesmen and political stalwarts of every hue and size and shape in the House that shameful day. Just what has our dignified culture, our much vaunted ancient civilisation, our ‘shame and honour’ society’s sense of decorum or gravitas descended into… such that they – all ‘honourable’ men – either sat there like plum puddings on their day off, or actively took part in the whole sorry lame-duck fracas? I am at a loss for words for once. So I will content myself in today’s column by simply saying this. (In addition to reiterating some recommendations made in an earlier piece, published in tandem on this page.) Sir, in fact sirs, you have sat there long enough for any good – if any – you might have done in the past… all 50-plus years of it for some of you, in fact both you contesting premiers. In the name of God and all that is holy in faith and philosophy held dear by my fellow islanders – go! Go now! And go quickly! And never come back! Go! But not before you make amends by paying for all the damage to State or public property; apologising hat in hand and shame on face to the people of the nation whose sovereignty you raped in public before an aghast international community; and chastise yourself in the mirror for being some cowardly cads in the same breath as you berate the members of your political opposition whose very character you reflect in the same style as you deplore them and their hooliganism. Also don’t forget to hand in your resignations as Members of Parliament, the leaderships of your respective parties, and the national ID cards showing that you barely belong to the human race. Maybe as one last act of merit you may gang together just this once in an act of repentance as much as realpolitik to impeach and collar and evict that despicable excuse for an executive whose lust for power and loss of any sense of propriety precipitated this crisis in the first instance. After all that – go! and never darken the threshold of our House ever again. 03.Parliamentarians must not be afforded the special privileged healthcare benefits they presently enjoy. Rather, they can and must participate in the healthcare system as the general public of Sri Lanka, whom they claim to serve. 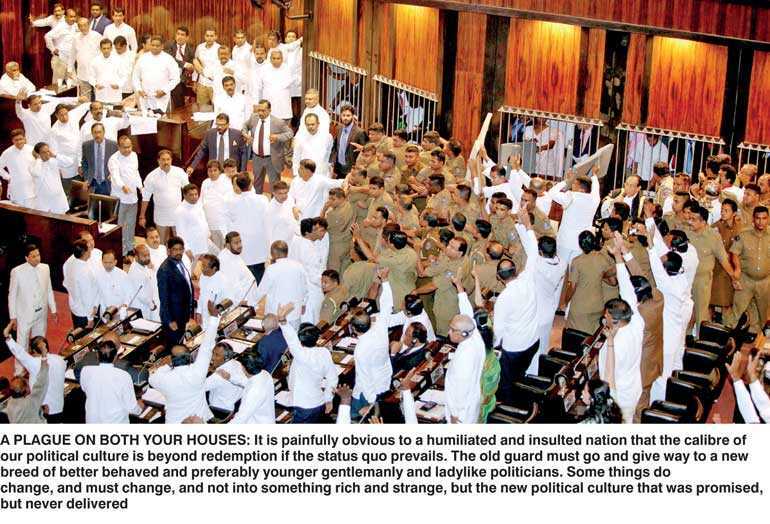 If they have to go to hospital to treat injuries sustained in the line of duty – as MP Dilum Amunugama had to, after ripping out the cord to the honourable Speaker’s microphone and wounding his palms – let it be to the prison gaol… Go to jail! Go straight to jail! Do not pass go! Do not collect any monies, pensions or praise for vandalism! 04.All concessions to MPs – such as free travel, fuel rations, and payment of utilities such as electricity, water, mobile or land phones – should be abolished. (Currently, they not only avail themselves of these concessions; but also regularly vote to increase it themselves; and boldly ask the people to tighten their belts via austerity measures and shamelessly absent themselves from Parliament if and when crucial national issues are debated.) I propose the public sponsor a free trip to prison for MPs Sanath Nishantha for manhandling police officers and Padma Udayashantha for baptising the police with a deadly cocktail of chilli water. No kudos to MP Johnston Fernando for tampering with electrical equipment either. 05.Parliamentarians with past convictions or criminal charges pending against them should be summarily suspended from our august assembly and prevented from contesting any future election – parliamentary or otherwise. There can be no exceptions to this rule, particularly at presidential or prime ministerial fiat, diktat or dispensation. If an MP is detected carrying contraband or weapons into the House – as MP Palitha Thewarapperuma was discovered with a butter knife purloined from the parliamentary canteen – he shall be prosecuted under the law as applicable to common or garden citizens, not under any special privileges afforded to legislative thugs! 06.To prevent alleged criminals or prospective cheats or charlatans from holding the previously highly-esteemed position of Member of Parliament, all MPs must make public declaration of their assets before and after assuming office, as well as be subject to scheduled/periodic and/or random audits to prevent their noble service from being tainted with the smear of bribery, theft, grand larceny, or corruption in any other form. 07.Any and every material, financial, fiscal or fiduciary losses incurred due to the conduct or misconduct of MPs while in office can or must be recovered from members of their families, nominees and/or properties or other holdings. As a first step, why not book MP Wimal Weerawansa for throwing a book – the ‘good book’ at that – at the honourable Speaker? Let’s throw the book at such hooligans, lock them up and throw away the key, shall we? 08.Parliamentarians should abide equally by all laws they impose on the general public and be subject to losing their deposit to say nothing of their parliamentary seat too if they are apprehended and indicted on charges of misbehaviour and misconduct. (Currently, being an MP is a ticket from everything to not paying parking fees or avoid a one-way ticket to gaol for murder, smuggling, cartels, etc. while appending the initials MP after their illustrious names.) I propose that MP Prasanna Ranaweera be subject to metaphorical waterboarding for wetting the honourable Speaker’s chair in an act of unpardonable mischief – the punishment fitting the crime would be for the MP to be fined and sentenced to two years of labour in the House, cleaning all other MPs’ seats, following his own suspension from Parliament! 09.Once elected, they must remain in the same party. Sure that some legal eagle with the judicious backing of political will on both sides of the House will be able to critique, challenge, subvert and reverse the insidious precedent established by a previous ruling; that in effect encourages ludicrous crossovers and endorses lawmaking with no regard for morals or ethics – much less common decency.